This is a hidden gem, if you enjoy peace and quiet in an off the beaten path location. CG is on main post but somewhat isolated, so you feel as if you're camping in a national forest/state CG. Brenda was very friendly and accommodating with us; they do take reservations with a max stay of 60 days. 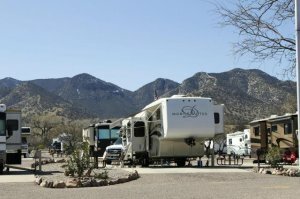 Tombstone and Bisbee are both close and can be visited in one day - they are a must see. Also, the two museums on post (Intel & Buffalo Soldiers) are worth seeing. PX mall area was closed due to remodeling (PX was open) and the commissary was large/well-stocked. WiFi was good and they also offered cable TV; that was a plus. Definitely enjoyed our short stay here - I'd recommend a minimum of 4-5 days so that you can have time to see everything.